Our thanks to Dan Orr, Wanatah Indiana, for contributing these photos, and our apologies for the time it took to get these up. "I love Gary architecture," writes Dan. "I am using a Sony F505 with a Carl Ziess lens. I like it because it has a 5X zoom, and I can get a lot closer to some of the architectural elements that I like to shoot." 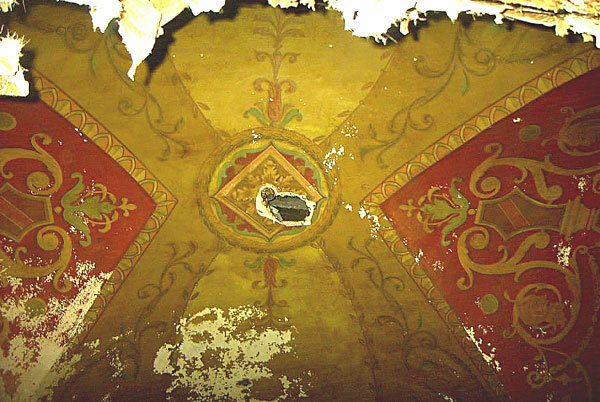 Mr. Orr's photos show some of the beautiful details that can still be seen in that building--the painted ornamentation on the sides of each row of seats, the still intact wall frescoes, the high ceiling, the (formerly) grand staircase. 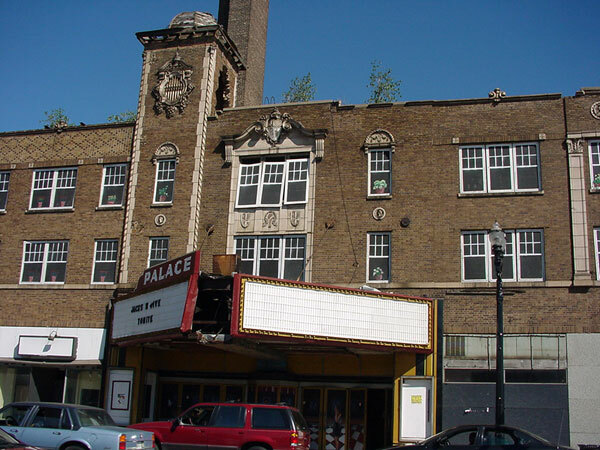 This is the last surviving movie "palace" in Gary. 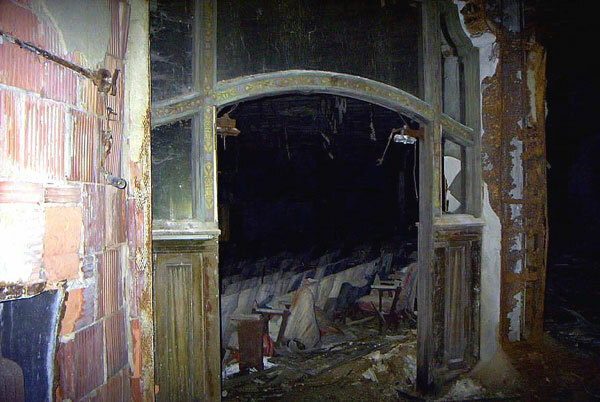 There is only operating movie palace in all of Northwest Indiana; the Illiana Hotel and Hoosier Theater in Whiting. 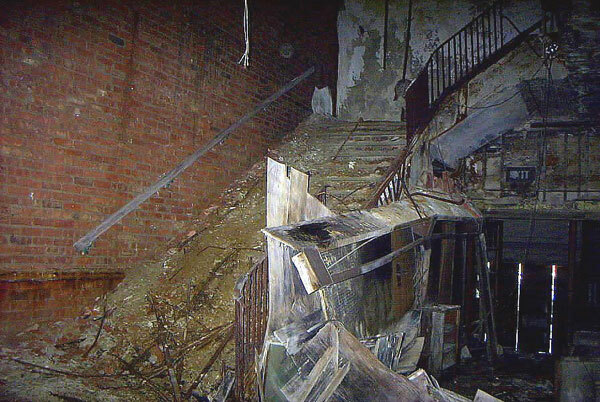 Back in 1987, three Gary doctors tried to breathe life into the Palace, which was closed at the beginning of 1972, and had several aborted rebirths since then. The doctors purchased it at a tax sale for $30,000. The doctors were William E. Washington, Keshadvd Aggarwal and Shreyes Desai. 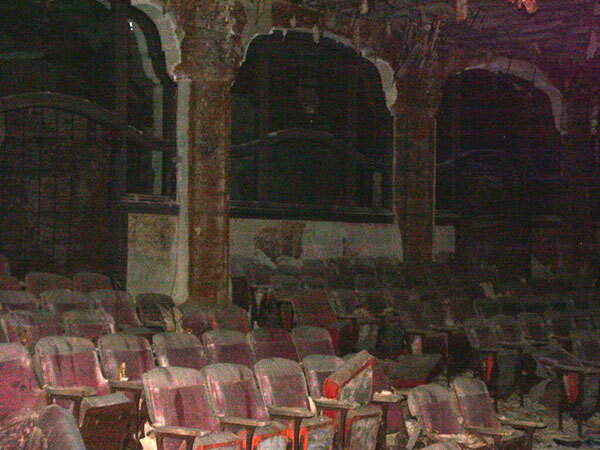 The three planned to invest between $500,000 and one million dollars to renovate the theater, the adjoining restaurants and storefronts and 27 apartments through their corporation, the Gandhi-King Corp. For a short time there was a restaurant in one of the storefronts of the theater building but that eventually closed up. 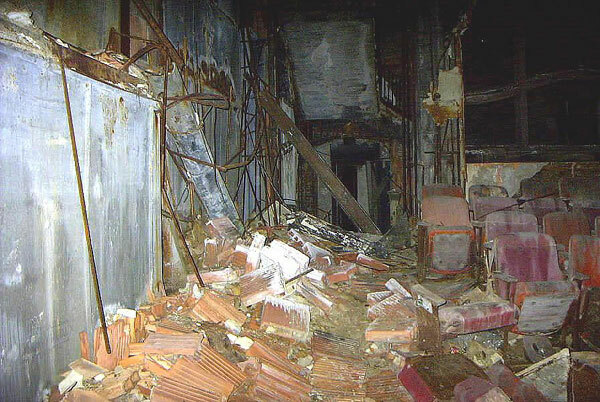 Now the theater continues to decay.You can read about the effort by the physicians to buy the theater in the February 9, 1987 Gary edition of the Post Tribune. Some people would doubtless argue that the people of Gary, Indiana don't deserve a building like this, properly restored. That they would not appreciate it, would not take care care of it, and would not patronize it. We don't buy this argument. Besides, wasn't the convention center, the Miss America Pageant, the casinos and now the Gary baseball stadium an effort to get people from outside the city to come to Gary? What a lovely attraction this would be. As it is, there is nothing for people to do in downtown Gary if they do come. So the building continues to decay, as the city pours casino profits into new (and redundant) housing complexes elsewhere in the downtown area. Site visitor Cynthia had some interesting questions and ideas She writes: Could the Palace Theatre in Gary be successfully converted into a stage theatre that would host a company like the African American Continuum Theatre in Washington, DC, and if so, would it attract large enough social and civic interest and audiences to be financially sustainable, if not profitable? Could the renovation of the building also provide opportunities for historic, "green" building and energy efficiency grants, funding and assistance? And would it be possible to expect representatives the city, its arts and cultural organizations and the schools and businesses of Gary provide interest, participation, and in the case of businesses and the city (and state), sponsorship for theater's productions, exhibits, classes and other activities? Period postcard shows The Palace shortly after it was built in the 1920s. It and the Elks Club Building shown in the foreground in this picture (now a city government building) are still standing. 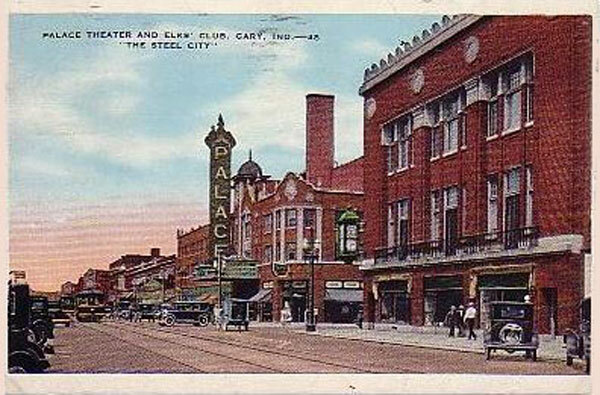 The Palace and the building shown in the postcard above seen from another angle in this modern-day picture by Dan Orr. 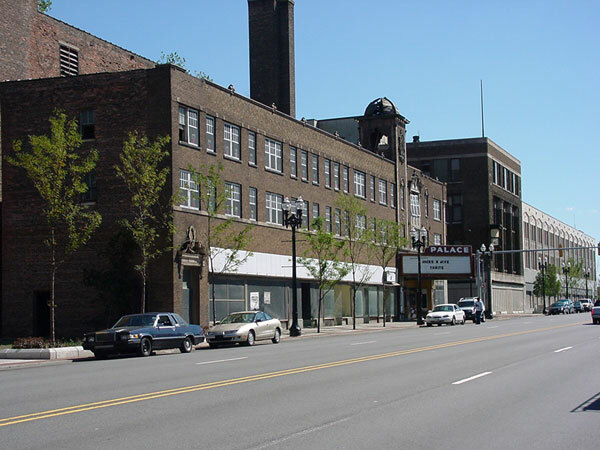 At far right is the old Sears department store building, also in use by Gary city government. For the Miss America pageant, which was hosted in Gary and which included notables such as Donald Trump and Martha Stewart, a ticket office agent was painted on the wood boarding up the ticket office window to "dress it up." Naturally, after the pageant was over, all this was forgotten about, and the false windows have started to fall off. Notice the holes punched in the Italianate tower of the Theater. 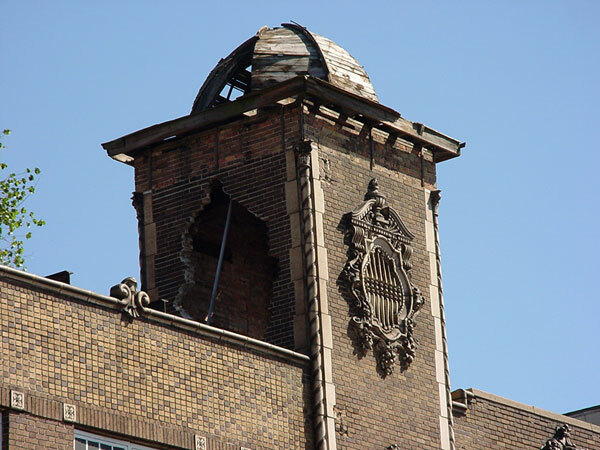 One preservationist has theorized that scavengers stole the terra cotta ornamentation off the building. That pole propping up one side of the tower to keep the whole thing from collapsing seems to lend credence to that theory. Detail of the old painted plaster ornamentation. Arched entryway from the lobby to the theater. Writes photographer Dan Orr, "I spent a lot of time there in my younger years, in the 60's. I became physically sick, when after more than thirty years, I saw the inside. It was an incredible place in its day." 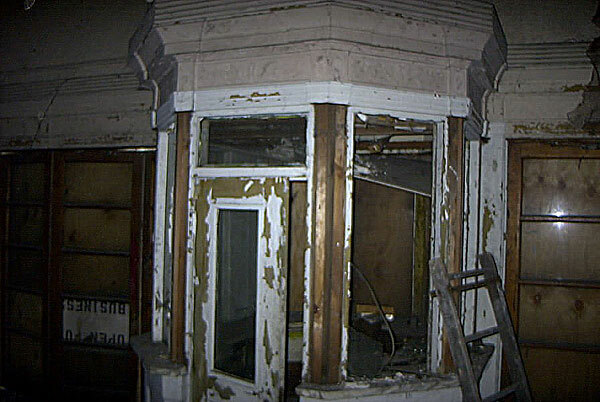 An example of what years of neglect will do to a structure. Some ornamental facing has fallen from the walls. 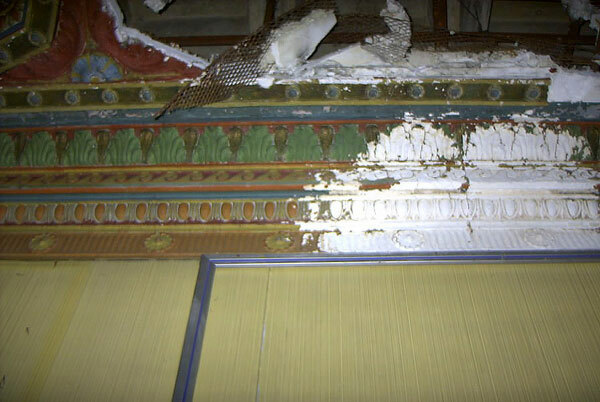 Quite possibly, the terra cotta ornamentation that was apparently stolen from the Italianate tower of the building allowed water to get into the building, causing this damage. The Palace must have been quite grand as originally built. The interior of the theater mixes Moorish (as seen in these arches) and Italian architectural motifs. 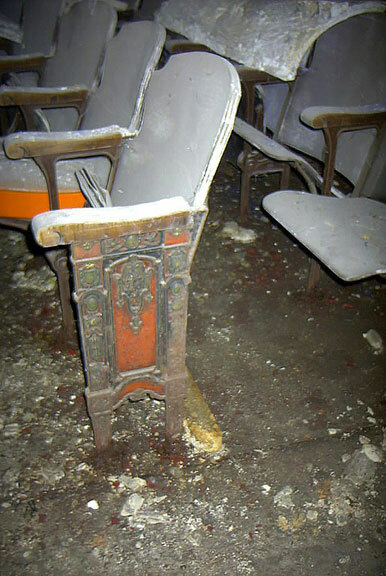 Note the painted ornamentation on the sides of each row of seats. Ceiling shot shows the richness of detail. 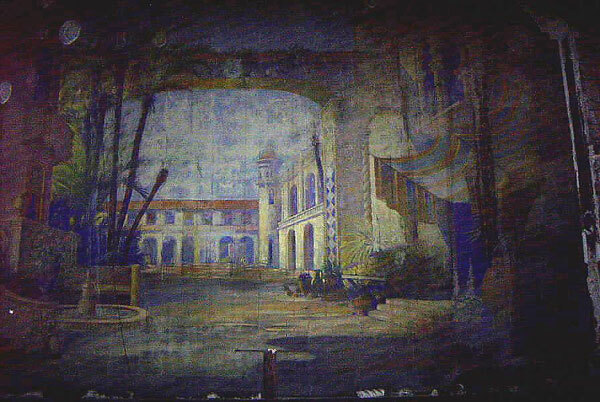 Still-intact wall frescoe depicting an Italian scene gives a hint of the glories of the structure as originally built. 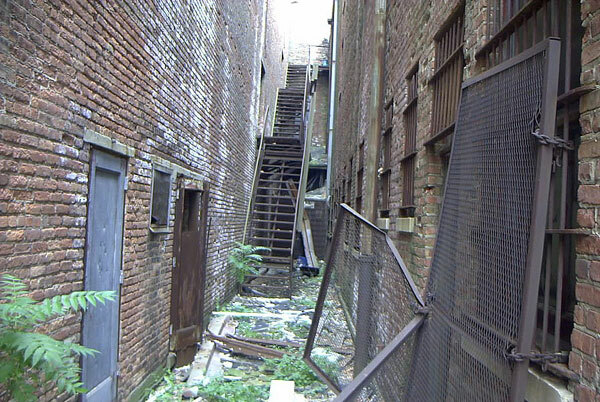 Outdoor walkway between two parts of the large building.